May 2, 2014 Josh competed in his first states meet and finished 7th in shot put with a throw of 48-6 in the rain. April 16, 2014 Josh finished 4th in shot put qualifying him for the states meet next month. Josh threw a personal best in a high school meet in discus with a 143'1" and breaking the school record. He finished 5th. April 10, 2014 Josh finished 2nd in discus at the Districts with a throw of 136-2 and finished 2nd in shot put with a personal best and almost beating the school record with a throw of 51-2.25. Fla Relays Josh competed in shot put and finished 10 th with a throw of 48'10.5"
April 1, 2014 Josh broke the school record and threw a personal best in disc with a throw of 143'2" finishing 1st and threw a 49'0" in shot put finishing 1st. 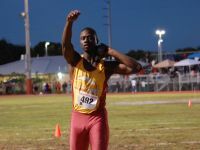 March 29, 2014 Pompano Express Meet Josh threw in shot put and discus and finished 1st in both. March 22, 2014 Josh threw a 46'3" in shot put finishing 9th in the county in shot put. Josh also threw a personal best in discus with a throw of 138'1" finishing 5th in county. 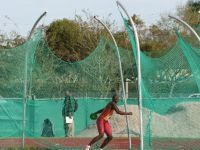 March 18, 2014 BCAA Prelims Josh threw a personal best of 48'8" in shot put finishing 1st. Josh also threw a 134'10" in discus and finished 1st. March 12, 2014 Josh threw a personal best in shot put with a throw of 48'6 finishing 1st in shot put and a 125'4" in discus finishing 1st. March 8, 2014 Josh threw a personal best in shot put and finished 2nd. 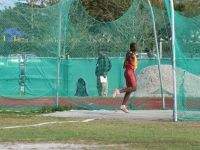 He threw a 125'6.5 in discus and finished 4th at the Hallandale Invite. March 1, 2014 Josh threw a personal best in shot put with a 48'4 finishing 1st and a 126'4" finishing 2nd in disc at the ARch Bishop Big Blue. February 28, 2014 Josh threw a personal best in both shot put and disc with a throw of 47 8.5" in shot and a 137'6" in disc at the Sam Burley. February 27, 2014 @ Hallandale against Boyd Anderson, Plantation and Pines Charter. Josh finished 1st in shot put with a 44'2.5" and 2nd in disc with a throw of 126'0". Louie Bing Out of a field of 65 Josh finished 9th with a throw of 45'7" for a personal best and finished 10 in disc with a personal best throw of 127'3". February 19, 2014 Hallandale, Everglades and Flanagan. Josh finished 1st in shot put with a 44'2" throw and finished 1st with apersonal best in disc with a throw of 126'5". Josh finished 2nd in shot put with a 43'4" at the Flanagan meet He finished 3rd in discus. 2013-03-23 Joshua went 43-0 in the Shot Put at BCAA Championships, placing 7th. 2013-03-19 Joshua got a PR of 111-7 in the Discus at BCAA South Qualifier , placing 9th. Joshua got a PR of 43-7 in the Shot Put at BCAA South Qualifier , placing second. 2013-03-16 Joshua went 38-6.75 in the Shot Put at 4th Annual USF/George M. Steinbrenner Invitational, placing 29th. 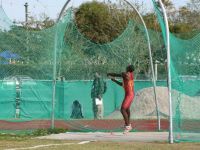 Joshua went 101-3 in the Discus at 4th Annual USF/George M. Steinbrenner Invitational, placing 39th. 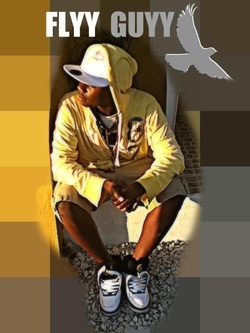 2013-03-09 Joshua went 93-8 in the Discus at Hallandale Invitational, placing 9th. Joshua went 37-11.75 in the Shot Put at Hallandale Invitational, placing 10th. 2013-03-02 Joshua went 95-5 in the Discus at Archbishop McCarthy Big Blue Invitational , placing 13th. Joshua went 40-5 in the Shot Put at Archbishop McCarthy Big Blue Invitational , placing 4th.